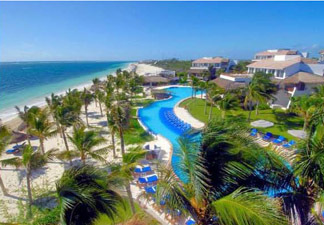 Xtabay Restaurant at Ceiba del Mar Beach & Spa Resort is a charming restaurant in Riviera Maya, Mexico where Chef Santiago Kantun's menu combines haute Mexican and Maya cuisine. The evening was perfect, warm breezes caressed the skin, Mexican music played softly in the background accompanied by the rhythmic sound of the fountain in the koi pond. Palm trees and the decorative grasses swayed as if keeping time to the music. Tables were dressed with white linens, white napkins, and traditional red woven runners, and accessorized with hurricane globe lamps. Wood armchairs with rush seats and beige cushions flanked the tables. At the entrance of the restaurant, there was a wooden sculpture of Saint Francis, and just beyond the entrance, is the well stocked, glass enclosed wine cellar. 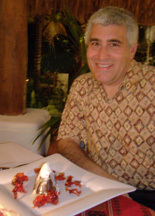 Executive Chef Santiago Kantun has created an exciting Mexican menu with Maya flavors, and Edward F. Nesta and I looked forward to experiencing his creativity during our dinner in May 2008. We sat a table on the veranda under a thatched roof of the restaurant, and watched the fountain come to life as it changed colors from white, to blue, green, and red throughout the evening. 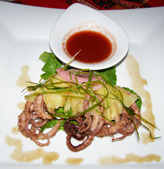 Edward began the evening with a cold appetizer (entrada fría) of Salpicón de pulpo bebe, sobre carpaccio de piña, aros de cebolla morada, salsa BBQ al chipotle (Baby octopus on a pineapple carpaccio, marinated purple onion, BBQ sauce and chipotle pepper), presented on a large square white plate with a generous amount of octopus topped with the pineapple carpaccio and marinated onion, with a bowl of spicy and flavorful BBQ sauce with chipotle pepper. I selected the cold appetizer of Callo de hacha con sangrita, al chile habanero aromatizado (Scallops with sangrita and habanero pepper), which were three perfectly grilled large scallops arranged on three leaves with a sangrita finish and a raspberry garnish presented on a square white plate. 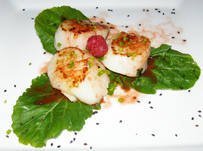 I loved the combination of flavors of the sweet and succulent scallops with the spice of the sangrita. 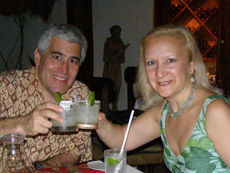 Although the restaurant has an excellent wine cellar, we decided that since it was our first night in Mexico that we should forego having our usual wine with dinner and enjoy Margaritas made with Don Julio tequila at the suggestion of our Head Waiter Santiago Lopez. 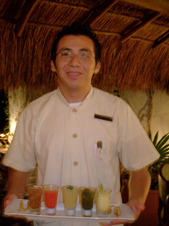 The Margaritas, on the rocks, salted rims of course, were fabulous, and paired excellently with our seafood appetizers. For Edward's main course, he had Poc chuc, solomillo de cerdo marinado con salsa de achiote y pure de frijol (Typical Yucatecan food, pork tenderloin marinated with achiote sauce, and mashed black beans). 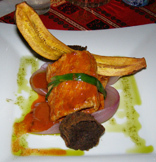 This dish arrived on a square white plate with the pork rolled and tied with a scallion presented covered with the achiote sauce, and placed on a bed of cooked Bermuda onions, with a round mound of mashed black beans in front of the pork, and garnished with a thinly sliced crisp plantain. There were several seafood dishes on the menu that looked wonderful, and loving spicy dishes as I do, when I saw the Camarones a la diabla (Mexican spicy shrimp), it was an easy decision. The shrimp arrived on a large triangular plate with a gorgeous presentation of shrimp bathed in sauce and arranged around a generous mound of rice, topped with thinly sliced grilled onions, and garnished with peeled cherry tomatoes and herbs. The shrimp were lovely, although I had wanted a bit more heat, as I am someone who Edward always teases, is able to eat fire. When I mentioned this to our waiter, Santiago, he quickly remedied this and I was able to enjoy my shrimp with a level of heat that perhaps most people might find daunting. The postres menu listed an enticing selection of desserts, but the one that captured Edward's sweet tooth was the Volcán de Colima, con helado de coco, piñas con aromas del trópico (The Colima volcano with coconut ice cream, pineapple scented with tropical aromas). This dessert was a winner visually and its combination of tastes of chocolate, coconut ice cream, and sweet and spicy sugar garnishes. I love sorbets, the more exotic the taste the better, and the menu listed an exciting selection of homemade sorbets, so my choice was easy; I selected the pineapple, habanero, coriander, tamarind, and rose sorbets. The colors were stunning presented in shot glasses on a rectangular white plate, and the flavors were amazing, especially the coriander which had a very spicy taste. Although each of the sorbets were well crafted I also especially enjoyed the rose sorbet with its delicate flavor and aroma, that was a perfect complement to the Maya experience. Xtabay Restaurant is open for dinner. 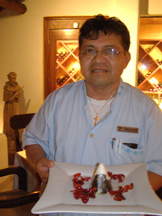 Please read other articles on Xtabay Restaurant and Ceiba del Mar Beach & Spa Resort in the Destinations, Hotels and Resorts, Spas, and Chefs' Recipes sections where Chef Santiago Kantun shares his tempting recipes.